Originally, both doors and the ignition switch used the same key on the '65-66 Mustang. Over the years, one or lock cylinders are replaced, and you end up with multiple keys. It's also common for cylinders and/or keys to just get worn too badly to continue using. 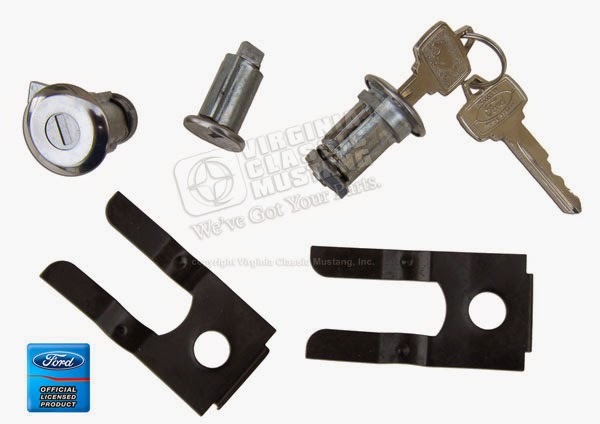 Whatever the case, we have super nice lock sets that include matching door and ignition cylinders. They come complete with retainers for the door lock cylinders and pre-cut, correct Pony / Ford keys - just like the originals. This kit is one of our most popular items and are very reasonably priced. Our part number is IN-501. Other years available.